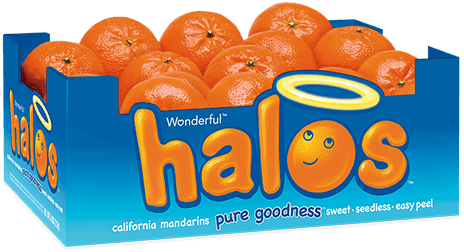 This post is sponsored by Halos™. As always, all opinions and recipe are my own. Thanks for supporting the brands who support Shared Appetite! Cookies are good. Truffles are too. But truffles inside of cookies? Heck to the yes. These Chocolate Orange Truffle Crinkle Cookies are beyond legit! I’m late to the baking game this Christmas. But there is still a week and a half before Santa is due to squeeze his fat tuckus down our chimney, so I’m gonna be pumping out cookies like it’s my job. The baking sheets are literally staying on the counter all week long. It’s not even worth putting them away for the few short hours they’ll have off each day. Side note. I’m impressed that I used the words zealous and hastily in the same sentence as I’m typing this post out late on Sunday night. 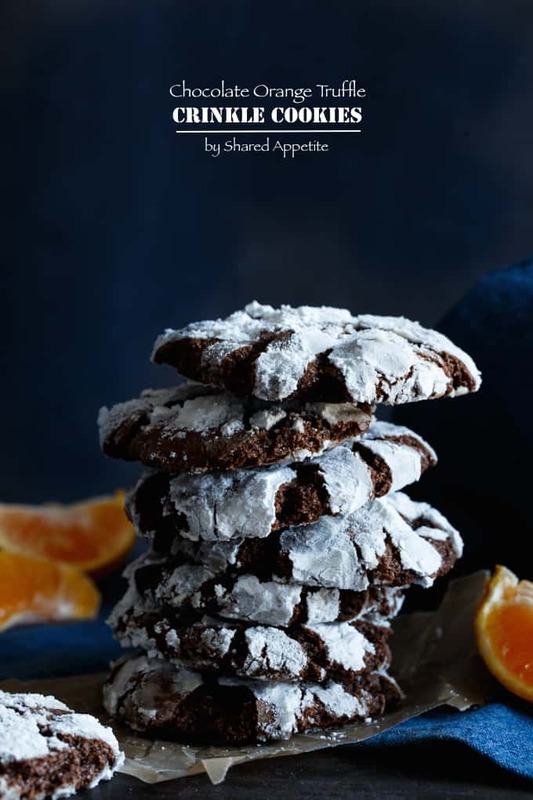 And these Chocolate Orange Truffle Crinkle Cookies? Equally impressive. And sure, we could have just stopped at making a quick and easy chocolate orange cookie dough and rolling it around in some powdered sugar before baking them off. But no. I’m all about going that extra step to impress the heck out of family and friends. We’re going to stuff these creative crinkle cookies with easy homemade chocolate orange truffles. Boom. Bring these bad boys to a cookie swap and you’ll get some instant cookie cred. See that molten center? That’s the truffle hard at work. And can we get a round of applause for Asheley, my beautiful wife, who graciously (without one sigh or eye roll) agreed to go all the way upstairs and change out of her pajamas an into an actual shirt so I could take those photos above… seriously, she’d appreciate some recognition. And for all you hand model agents out there, she’s available for hire. In a small bowl, combine flour, cocoa powder, baking soda, and salt. In the bowl of your stand mixer or a medium mixing bowl fitted with an electric mixer, beat butter, brown sugar, and granualted sugar until light and fluffy. Beat in egg and vanilla. Add in dry ingredients and mix until just combined. Stir in orange zest. Cover bowl with plastic wrap and refrigerate for at least one hour, or up to a few days. When ready to bake, preheat oven to 375°F. Remove chocolate orange truffle filling from fridge and allow to soften a bit. Break into bite-sized pieces (about 16-20). Take a spoonful of dough and flatten with the palms of your hands. Place a piece of truffle filling in center of dough, and wrap around dough to fully enclose truffle, smoothing and rolling out into a ball with your hands. Repeat with remaining dough. Roll dough balls in granulated sugar, and then in powdered sugar. Make sure to very generously coat dough balls in powdered sugar in order to get that crinkle effect. Place on baking trays and bake approximately 10 minutes. Remove from oven, let cool on tray for 5 minutes, and then transfer to a wire rack to finish cooling. Serve warm for that ooey-gooey truffle center! Place finely chopped dark chocolate in a small bowl and set aside. Microwave heavy cream in a microwave-safe bowl until very hot, about 30 to 45 seconds. Keep an eye on it to avoid bubbling over. Slowly stir cream into chocolate, and continue to stir until chocolate is completely melted and smooth. Stir in orange zest and place in refrigerator to chill. 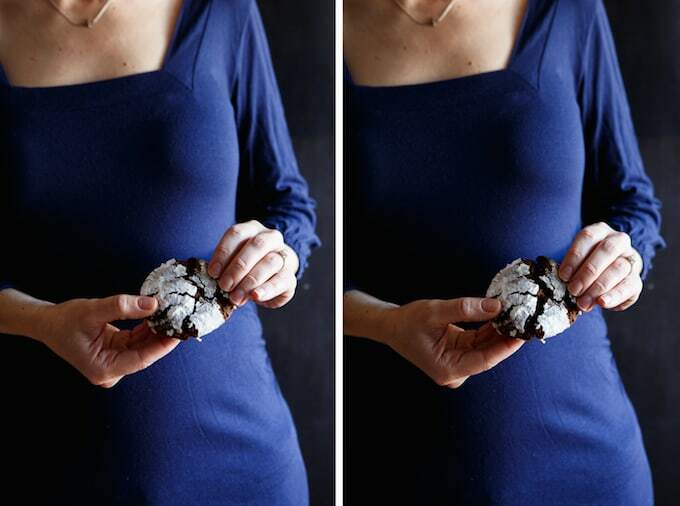 For a larger yield of cookies, break truffles into tinier pieces (which will require less dough to fully enclose). 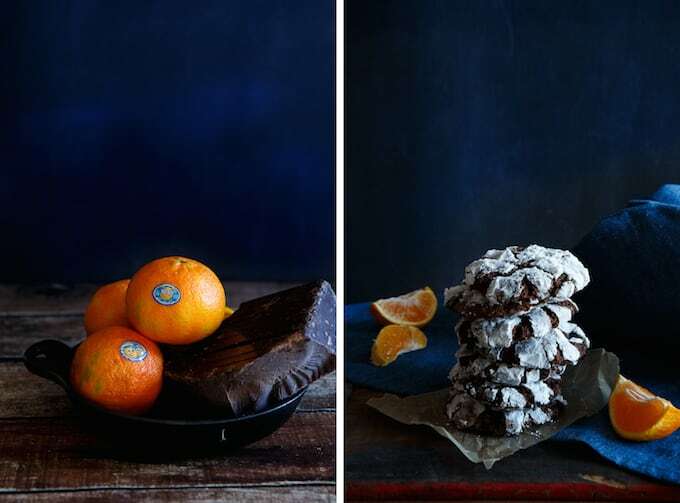 These cookies were made with Halos™ mandarin oranges. I actually picked up a bag of them at the grocery store last week in anticipation of cookie baking. One problem. I didn’t think about the Asheley factor. Halos™ are sweet, juicy, seedless, and best of all… super easy to peel. And, guess what? They are non-GMO! That’s a huge win right there. Get your family excited about fresh food and activities they’ll love. Learn more about Wonderful Halos on Facebook or the HalosFun blog. You know I’m all about the chocolate. Yum! And Asheley, you rock girl. What a sweet wife and I just love your heart! Pinned to our *Chocolate Board*. And Chris, pictures turned out amazing! I had made Chocolate Crinkle Cookies with Cottage Cheese and I know how good they are. I can imagine the flavor of this cookies with a molten center that gives the Citrus punch. Sounds delicious!!! Wow with cottage cheese?! That’s awesome Shibi! A seriously legit flavor combo, these look awesome, Chris! 1.) I ordered some new backdrops from Swanky Prints per your food photography post, and I can’t thank you enough for the reference, I’m loving them! 2.) Your “moody” shots have really inspired me to try out some new photography (aka tomorrow’s recipe) – Stay tuned! So happy that you are loving your backdrops from Swanky Prints! Can’t wait to see them in some photos! And thanks so much for your kind words… that totally made my entire day! You’re the best! Ohmigerd! 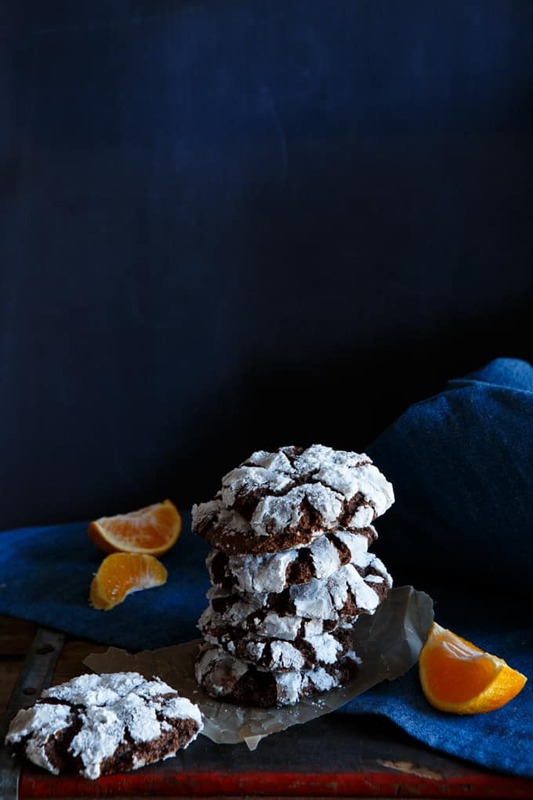 Chocolate crinkles make me swoon… and you just used my very favorite citrus fruit in the whole wide world. You just rock! What gorgeous cookies! My boyfriend was just telling me the other day how much he loved those candy chocolate oranges as a kid, so I bet these would make a great surprise for him 🙂 I’ll warn him about the powdered sugar, though – that stuff can be seriously dangerous! Hahaha it totally can be dangerous… although I have to fully admit, isn’t it awesome when you are watching someone try to inhale a cookie to fast and they start coughing on the powdered sugar?! It’s pretty funny stuff. I’m sure Santa is going to love these cookies, I mean, they’re perfect! The pictures are also amazing. Haha – BEAUTIFUL hand model. She chose the perfect colored shirt too. 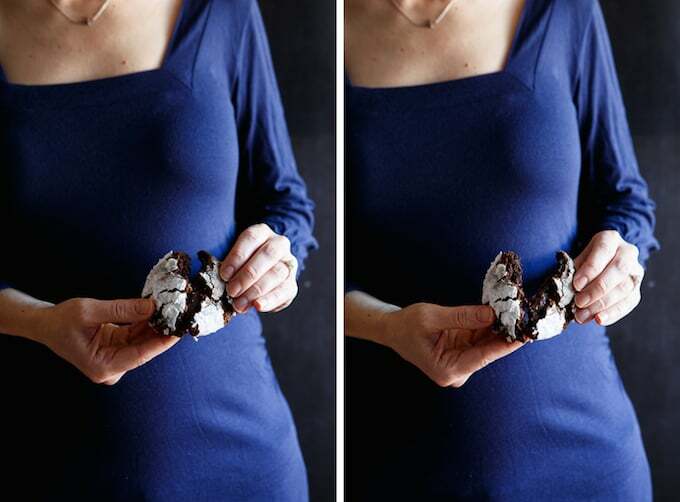 She makes these cookies look good – the cookies should be thanking her. (Also – that molten center?! OMG). Drool. I’ll pass along your compliments to the model. To be honest, I picked the color shirt lol!!!! Ohhh I late to the baking too, I just made my inaugural batch last night!!! What?! These are drop-dead gorgeous Chris, and I love that they’re amped up with orange! Glad to know I’m not the only procrastinator this year! Merry Christmas to you and yours Nicole! I’m not really exaggerating when I say I’m in heaven just thinking about these cookies. I’ve made choc orange truffles before and they were one of the most delicious morsels to ever pass my lips – I’m not sure I could handle how scrumptious these stuffed crinkles would be … mmmm, pinning!!! Hahaha thanks Helen! Merry Christmas to you and yours! Hahahaha oh I know. I was really impressed she did it without complaining or giving me an eye roll! Chocolate + orange is the beeesssstt!! Well, so is chocolate + peppermint, chocolate + caramel, and really chocolate + anything, but these cookies look awesome! I have to add these to the Christmas cookie list! Wow, they sound easy to make and look SO delicious!! A nice, slightly different and very delicious cookie. A winner! Oh my gosh wow! 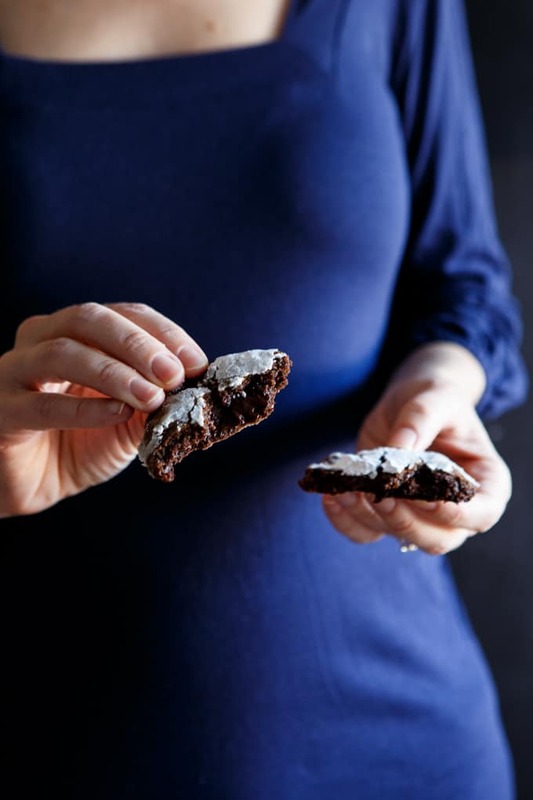 Ok I made a chocolate orange crinkle this year too but your version totally has me beat. I am dying over that molten chocolate center! And the photos are killer as always. Love that collage of the cookie being broken! Thanks so much Allie 🙂 Yea, that molten truffle center is killer! 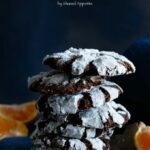 Dude, these Chocolate Orange Truffle Crinkle Cookies are gorgeous!!! I will proceed with caution when inhaling these beauties!!! they look so good!!! Hahaha thanks Alice! Glad to know the powdered sugar won’t get you like it did Asheley! You are too funny!! Hand model?! She does have nice hands and I applaud her for changing out of her probably comfortable pj’s. I’ve been there before. But holy moly, these cookies look divine! Love the filling in them too! I love a good crinkle cookie! It’s still a few days till Christmas so I can definitely squeeze this recipe into my holiday baking list. Thanks Chris for the idea! Hahaha there’s totally plenty of time for cookie baking!